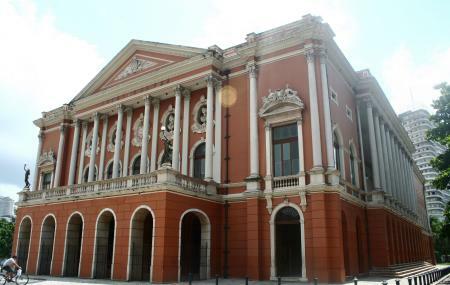 Opened in 1874, in a time that is now known as the ‘Golden Age of Rubber’ in Brazil, the theatre is now regarded to be one of the greatest examples of Italian style neo-classical architecture. Since then, it has been home to many magnificent theatrical and operatic productions, and continues to be one today. Even if you’re not inclined to actually catch a show, you must at least take a guided tour of the premises, and gain an insight into the Rubber Age influences of art and architecture, such as the French statues, the ornate chandelier, Portuguese tiling, and busts representing music, poetry, comedy and tragedy. Contact the establishment for prices of guided tours. Check the attraction website box office for show prices. Guided tours last about 30 minutes, and set out every hour at 9am-12pm and 2pm-6pm. How popular is Teatro Da Paz? People normally club together Estacao Das Docas and Catedral Metropolitana De Belem while planning their visit to Teatro Da Paz. Very interesting place, filled by historical references of the 18th snd 19th century. The theatre architecture is eclectic, mainly built under neoclassical style. If are you interested on local history, this is an excellent place to visit. Although the building is impressive, the ttheatre tour was closed due to a show that weekend, quite a blow on our enthusiasm as we heard it's an impressive theatre. Very beautiful theater in Belem City center. Interesting Brazilian history monument. Worth the cultural visit. Amazing location and nice open air bar in front.